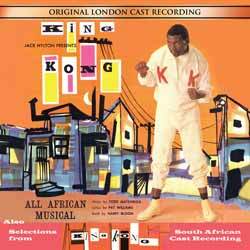 King Kong was a pioneering South African musical which portrayed the life and times of the heavyweight boxer, Ezekiel Dlamini, known as "King Kong". Born in 1921, after a meteoric boxing rise, his life degenerated into drunkenness and gang violence. He knifed his girlfriend, asked for the death sentence during his trial and instead was sentenced to 14 years hard labour. He was found drowned in 1957 and it was believed his death was suicide. He was 36. Billed as a 'Jazz-Opera', King Kong featured music by Todd Matshikiza and lyrics by Pat Williams. The production was first staged at Johannesburg's Witwatersrand University Great Hall, opening on February 2nd 1959 and went on to take South Africa by storm. Nelson Mandela attended the opening night and is on record as highlighting the show as his favourite musical. The original South African production starred Nathan Mdledle, Ruth Nkonyane, Dan Poho, Joseph Mogotsi and Miriam Makeba, helping launch Makeba's international singing career. West End theatre impresario Jack Hylton was determined to bring the ground breaking South African musical to London, insisting that as many of the original cast members as possible transfer with the production. King Kong subsequently opened at London's Princes Theatre on February 23rd 1961 and ran for 201 performances. Critics praised King Kong for its inventive staging, stand out performances and vibrant score. In more recent times, King Kong has been recognised for the pioneering role the production played in breaking down racial barriers, defying the colour bar and uniting black and white South Africans at the height of the apartheid era. In 2017 the musical was profiled by BBC Radio 3 and later revived in South Africa by the Fugard Theatre Company. I was pleased to hear that Stage Door were releasing the original London Cast on CD for the first time, and also (as they so often do) including some great bonus material - selections from the original South African Cast recording, and some pop covers of songs from the score. It’s a nicely packaged CD, and has excellent sound quality. It’s an interesting listen, and a surprise for me as I thought it was about the big gorilla before reading into it! The musical does catch the South African township vibe very well, and is well performed. Some of the songs are catchy, in particular ‘King Kong’, but I did find myself instantly forgetting several, as they are pretty derivative of each other. Musically too it’s well performed, by what sounds like a medium sized big band (there’s unfortunately no mention of the players in the otherwise excellent liner notes) although the mix between vocals and instruments at times could be better. ‘The Earth Turns Over’ is a nice ballad, and this is also included as a bonus track which Elaine Delmar performs nicely. The rest of the Bonus items are excellent too, especially the South African Cast recording tracks which I actually preferred in many ways to the London Cast ones. Another piece of theatre history that is great to finally have on CD, even if I probably won’t return to it on a regular basis.